Smiffys Halloween Skeleton Make Up Kit. This Kit Includes Face Paint, Black Crayon And Sponge. Smiffys Halloween Vampire Make Up Set. The Set Includes Fangs, Sponge, Face Paint And Blood In A Tube. Smiffys Halloween Witch Make Up Kit. The Kit Includes Face Paint, Nose, Crayons And Sponge. Smiffys Halloween Pretty Witch Make Up Kit. The Make Up Kit Includes Face Paints, Face Tattoos, Gem Stickers, Crayon And Applicators. Smiffys Halloween Devil Make Up Kit. The Kit Includes Face Paint, Nose, Crayons And Sponge. 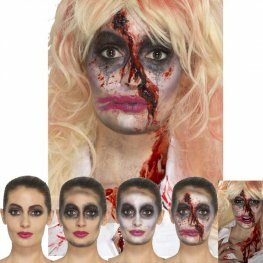 Smiffys Halloween Female Zombie Make Up Set. The Set Includes Face Paint, Blood Capsules And Sponge. Smiffys Halloween Zombie Latex Make Up Kit. The Kit Includes Face Paint, Fake Blood, Gel Blood, Liquid Latex, Horror Flesh And Applicators.